It's been a busy few months and V&W HQ and our poor little blog has been ever so slightly abandonned! 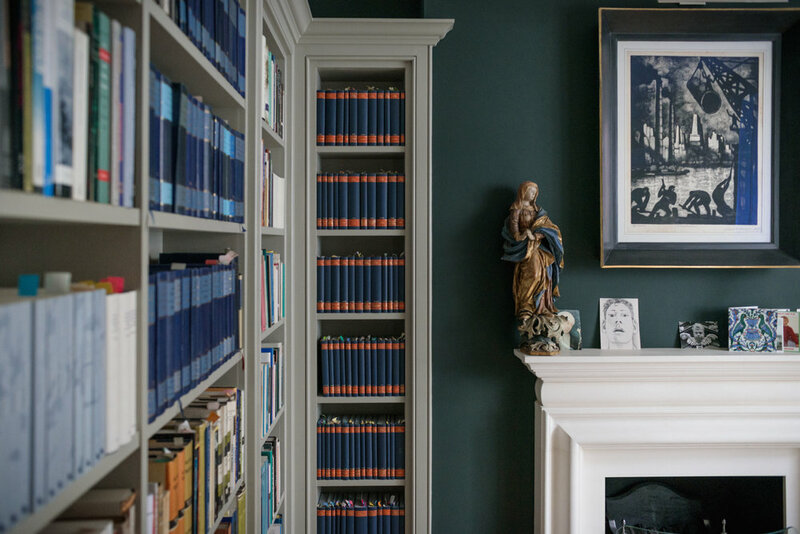 However, with the freezing weather outside, we thought it would be a nice time to curl up and read about another one of inpirational women, the wonderful Interior Designer Claire Beaubien! We first met Canadian Claire when she came to one of our 'Meet the Designers' events at Fenwick of Bond Street - she has been a huge supporter of our little brand for some time now, and we love how she styles our pieces as day, night and eveningwear. We needed to discover more about her, so we did a little interview! I am an Interior Designer based in London and one half of the company, Clemente Beaubien. Originally from Canada, I have been living in London for over 20 years. I currently live in South London with my husband, Inacio, our son, Carlos, and two kittens. Our office is right by Imperial Wharf and the Design Centre. Being so close to the Design Centre means I have a great relationship with the showrooms and suppliers and I often bring clients there for a coffee or lunch and to walk around. How did you start out in your early career? Have you always been in the field you are now in? I have a Master's Degree in Fashion Design and I actually started out in the fashion industry, designing collections for a large international company. But ultimately interiors is a much better fit. Having studied Art History as my first degree has helped me enormously. All of my design experience and education have strengthened my skills as an Interior Designer - and I’m still learning! I love what I am doing now, this is my dream job. Going forward, I'd love to have my own range of fabrics and accessories. How did you get started? Where did the seed of inspiration come from? When I was little my mother worked with a French Interior Designer named Mme Carisse . I loved visiting her office and my mother let me spend hours with her, lost in piles of swatches and samples. I would sit quietly surrounded by overflowing ashtrays and the general mayhem of the studio. She encouraged me to tell stories through design. I learned there how different materials and colours could inspire different ways of feeling. I have had several mentors; so many of the older women in my life have had incredible vision and strength. I had an aunt who took me under her wing and really championed me. She encouraged me to look beyond fashion as a career and to think instead about interiors, for which I will always be grateful. I've been an Interior Designer for 15 years but started my own company seven years ago. What motivates you to continue to keep what you do fresh and innovative and how do you grow the business? I am very lucky; my business parnter, Juana Clemente is an incredible designer, full of energy and positivity. We constantly challenge each other to expand and improve on our work, even if that means arguing occasionally. It's so important to stand your ground on an idea but also to sometimes say, 'I don't like this, but I respect it'. That's how we get the best results in the end. Where do your creative ideas / inspirations come from? Everywhere, really. Whenever I travel or visit a new part of town, or go to an exhibition, I make a point of gathering images and remembering what really strikes me. When something strikes me as important, I document it. Having a wealth of references to work with in invaluable. I get up at 5:00, have a coffee and feed our cats, then I do a barre workout. I get myself ready and then wake up my son, get him ready for school and kiss my husband on his way out to work. After dropping my son at school I head to the office. Normally I'm working by 9:00. How do you wind down and find that all important work / life balance? I haven't - please, if someone figures that out, I'm all ears. You have an unexpected day off - what do you do? I would have a gentle and leisurely morning, visit a show or exhibition, then have lunch somewhere special and read a book. Describe the most inspiring view in the world? St Marco's Square in Venice. Pretty much any view of Venice. Do you have a favourite place to eat or a desert island meal? My husband and I recently had the most incredible meal at Xu, a Taiwanese restaurant in Soho. Not only did we have one of the best meals I can remember, but the interior is very 1930's film noir, sultry and elegant. One thing you have done that you think everyone should try in their lives? Being really and truly kind to yourself. What is your most unforgettable memory? When I was five, I was visiting London with my father for the fist time. We visited the London Zoo and I got to feed the giraffes. I was tiny and this huge and gentle creature swooped down its long neck to eat out of my hand. My stomach felt like I was on a roller coaster. I have loved giraffes and this city ever since. The most surprising / unexpected thing about you? I love watching horror movies and eating Haribo Tangtastics. Your most recent act of kindness? Saving a tiny mouse with my son. We made a teeny tiny home for it, along with a bed, pillow and security blanket. What are you reading a the moment? I am re-reading one of my favourite books; Alias Grace by Margaret Atwood as Netflix is about to release it as a series - very exciting! Do you have a favourite artist and what do you like about their work? Mirko Hanak. He was an incredible Czech artist who painted the most luminous and magical illustrations of animals and Fairy Tale characters. He combined traditional European and Japanese watercolour techniques to create something totally unique. Describe your style. Who is your style muse? Feminine, delicate and strong; I gravitate towards clothing with embellishment or prints within strict or simple shapes. I love the style of Lou Lou de la Falaise and Tina Chow; they were both effortlessly chic. Where do you like to shop? Who (either a high street, designer or niche brand) do you think are doing a great job at the moment? When time permits, I love having a wander around Portobello Market and charity shops. Generally, I don't have a lot of time, so shopping online is great - I love the Outnet, Net-A-Porter and Moda Operandi for occasional splurges. Vilshenko, Johanna Ortiz and Peter Pilotto have been producing beautiful collections. Who is your go - to brand? There are pieces of clothing that, regardless of the situation, make you feel like you could conquer the world as soon as you put them on; a second skin and very familiar layer of armour. Mine is an Armani coat I bought 15 years ago. it has just started to fall apart but I am hoping it will make it through one more winter. Your life is all about interiors - do you have a favourite piece of furniture? The garden furniture that belonged to my Great Grandparents; it has travelled from Florida to Canada and is now with me in London. Violet and Wren! Wrapping myself in such exquisite beauty is an absolute joy.